Have a favorite fabric or wallpaper pattern you want in a rug design? Or, do you want to pull colors together from your furniture and home decor to balance your interior design? Custom rugs are often the best choice when you have a particular image, design, size or shape in mind. Customizing rug to match your heart’s desire can be fun and easier than you think! We’ll help you bring your creative vision to life. There are over 1600 standardized wool color samples to choose from! 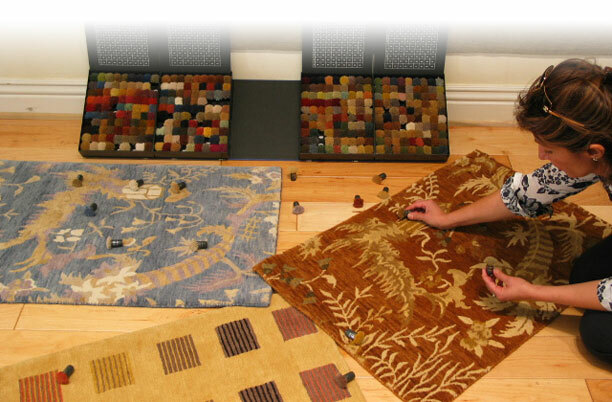 Simply choose to enhance one of our custom area rug designs or come with your own designer rug by bringing in favorite fabric, photo or a printed image of a pattern. Custom color and size orders are available in 12 weeks (up to 9 x 12 feet) and we can also accommodate irregular custom sizes and shapes up to 40 x 60 feet. Custom rugs are available in rich textures ranging form nomadic weaves with long, radiant, lustrous plush pile with supple handle, to dense, fine weaves suited for detailed and sophisticated patterns. For every custom made rug order, The Rug Affair provides a detailed high definition image within a few days for your review. A small hand woven strike-off sample can also be provided within 4 —6 weeks for your approval prior to starting the final hand knotting of your unique rug. Specify your color, size and pattern. Choose from over 1600 dyed wool standardized colors. See your vision of your new rug in a high definition digital image printed for your review. Preview handmade samples for your approval prior to weaving of these one of a kind custom area rugs.